We think [Thomas Brittain] is onto something. We often post to our personal blogs so that we have a reference to how we did something. But he also keeps a long post that documents his abandoned projects. It ends up serving as a quick start if he ever decides to pick up the torch once again. Lucky for us he’s included his failures in the write up. This Fail of the Week features the top two posts on his Incomplete Works page. The first is an attempt to make his own pulse sensor. The second is a miserable experience with a cheap Bluetooth Low Energy module. For the board on the left, [Thomas] managed to release some smoke from the components during the first test. As a learning experience he decided to recreate an open hardware pulse sensor. It is made up of an op-amp reading from a photo sensor, paired with an LED to light up the tip of your finger. He laid out his own board in Eagle and put in a $2 order with OSH Park. The image above shows [Thomas] reflowing the photo sensor using his clothes iron. After the rest of the assembly was complete he fired it up — producing the oft mentioned magic blue smoke. A second run on the board ended in folly also, perhaps because he reused components from the initial “smoked” board. One thing that this failure turned up was an interesting article on counterfeit parts. We love reading about counterfeits so we’ll just drop a couple other links here to fake Arduinos and fake Apple PSUs. 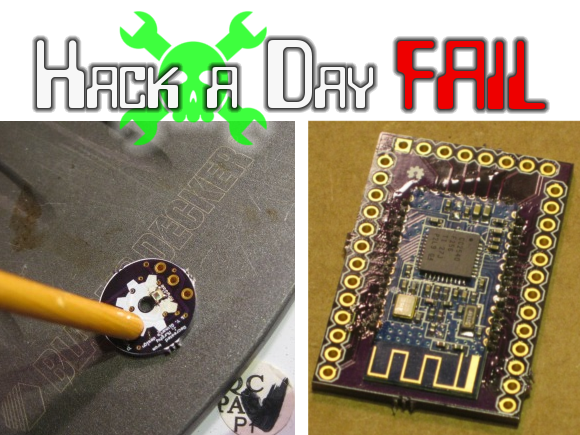 The second fail is a Bluetooth Low Energy module that never showed the performance [Thomas] desired. He started off the project with the intent to use a TI CC2540 radio chip directly. But when he was elbow deep into modifying an example PCB for cheaper printing he decided to pivot. Without proper tools to troubleshoot the radio signal he figured it best to go with a module and just make his own breakout board. Above you can see the HM-10 module soldered to his breadboard friendly PCB (also from OSH Park). Those who have played with Bluetooth modules may already see this coming, but a chunk of his troubles were caused by the firmware running on the chip and a general lack of guidance on how to interact with the firmware’s features. Furthermore, level conversion was an issue. And when he did finally see some results from the device the effective range was just a few inches. Bluetooth Low Energy is just starting to pop up in hobby electronics projects. We’d love to hear your own experiences — good or bad — with BLE hardware. Please leave a comment if you have a story to share. i have a ton of those little china bluetooth modules. loaded up (iirc) linvor firmware on all of them. i had bought one nice one with it, then a bunch of cheap ones with the inferior fimware, aquired a copy of bluelabs with my student email for registration. Then i dumped the firmware and reflashed all of them. easily sent data from over 10 feet with no missing packets. It was the ground plane under the module–I corrected it. Didn’t realize the HM-10 was going to be mentioned here. I’m now in love with those little modules. I’ve had some problems with the bluetooth modules as well. I was helping someone finish their diploma project and when he came with his self-designed boards already etched I knew it was going to be a looong ride. Except the numerous issues (3v-5v mismatch, 85-120 vias per board, shorts, …) there was also a generous ground plane under both radio modules (BT and 9xxMhz). BT behavior was crappy (at best) and I ended up sending the same thing 20 times just to make sure it was received at least once. If this is HADs cup of tea I probably need to write about 3 articles because there are a lot of lessons to be learned out of that [failed] project. Just need to ask my friend first if it’s ok to drag him through dirt. Thanks, fixed. As I’ve said before, I have no idea why the WordPress spell checker doesn’t check the titles. Wow, that’s a lot of fail on one page! Not so bad considering how many different projects it’s from though. Thanks for sharing, [Thomas]. I had a great fail that consumed last night. Tried to install a mini-PCIe wireless card in an old laptop. Card installed and detected, but no comms. Found that the laptop had a slide switch to enable wireless, but it had no effect. Also had a keyboard hotkey, but no luck in getting it working either. In desperately searching Google, I discovered you could mask off pin #20 on the card edge connector to force it enabled. I reach into my tape bin, and spot some odd tape I’d picked up somewhere a long time ago and never used. Conveniently, it was exactly the right width, so I used it – but it still didn’t work. Getting aggravated, I cut the trace going to the pin. And it finally worked. So why didn’t the tape work? Turns out it was CONDUCTIVE tape. Yup. It was the ground plane. When Mr. Mike told me he was putting my failed work up, I thought he meant just the Pulse Sensor, which I’ve yet to solve. But the HM-10 I have working great; getting approximately ~30 feet indoor and the mAs pulled won’t register on my MM. I’ve still not written software to make them computer or handheld-device friendly, but I showed it possible using the iOS app Lightblue. I sadly don’t own any BLE Android devices (Jellybean 4.3 has a BLE API) and I’m too cheap to pay to for an iTunes Connect account. It’s not BTLE (BLE / BT Smart) but very similar. I’ve successfully made a board based on the nRF51422 ANT+ chip with a toaster oven and copied a trace antenna (needs tuning). In fact I’ve made 6. There is a BLE drop in replacement chip called the nRF51822. It doesn’t need any changes, they are both identical pinouts. It has a built in ARM Cortex M0 and all pins can be assigned to any type of interface, you’re not locked in. Best part, chip has a built in transceiver and can be had as cheap as $2.60. A board + components can be < 10 dollars and way more powerful than an Arduino. I plan on getting the nRF51822-EK down the road and port my project to BLE. Debating releasing the board design because some changes are happening with the project. Plus BLE is a little harder to understand compared to ANT+ for sports. Fixed the Pulse Sensor problem as well. Thank’s HaD. I guess I just needed a little pie in the face for motivation.